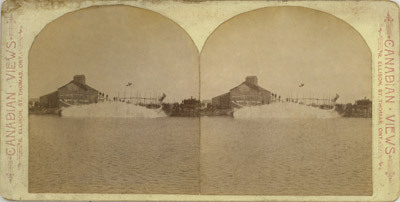 Stereoview of the wooden hull of the JOE MILTON as the big splash in made during her side launch at Port Stanley in 1891. The crowd of spectators cheers as the banner begins to unfold (the dark object at the top centre. In the detail two men can be seen inside the hull, while others are revealed to have been standing on the scaffolding behind the hull. R. Ellison, St. Thomas, Ont. Handwritten on reverse: "Launch of the Str Joe Milton"